This is another one of my wife’s Indian-style dish. 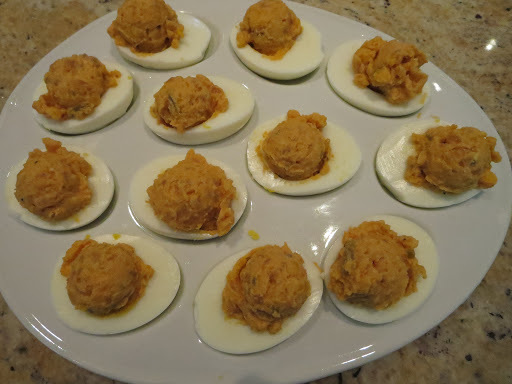 This may be my wife’s modification to make deviled eggs and the original recipe might be somewhat different. Our good friend who passed away recently, used to make wonderful deviled eggs which prompted my wife to make her own deviled eggs and also bought a special plate for deviled eggs. Although it is rather old fashioned appetizer, I heard, it is making a comeback with new twists. 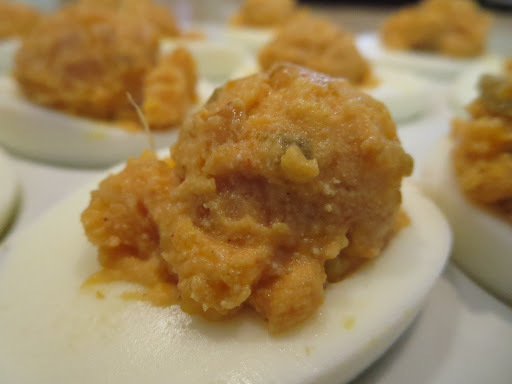 So, this is her contribution to this trend; Indian-spiced deviled eggs”. Here is one serving with my usual tomato flower. Here is a dozen (or 6 whole eggs) on a serving platter. After I made poached eggs in spicy cream sauce. I had a lot of sauce left over. It was so good I had no intention of not using it. In addition, it had become very thick. 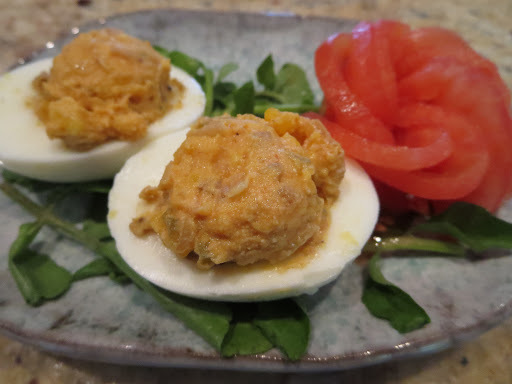 Since the original recipe used it with eggs I got the idea of making “indian style” deviled eggs. I boiled up 6 eggs and cut them in half. I removed the yolks and mashed them with a fork. Then I added the sauce to the egg yolks until I achieved a consistence in which was thick enough to hold its shape when I put the mixture in the cooked egg whites. I used a small scoop to make the yolk mixture into a ball that fit into the cooked egg white. This was a delicious variation on an old-tried-and-true favorite. It was interestingly spicy with many layers of flavor.